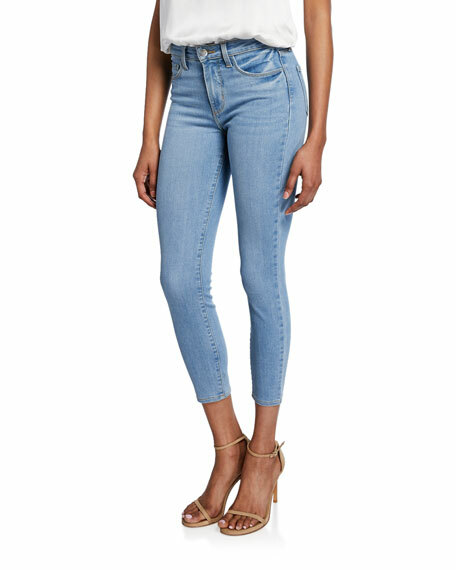 7 For All Mankind jeans in Distressed Authentic Light 9.7-ounce stretch denim with whiskering and fading. Approx. measurements: 7.5" front rise; 12" back rise; 26" inseam; 13" leg opening. For in-store inquiries, use sku #2078694. 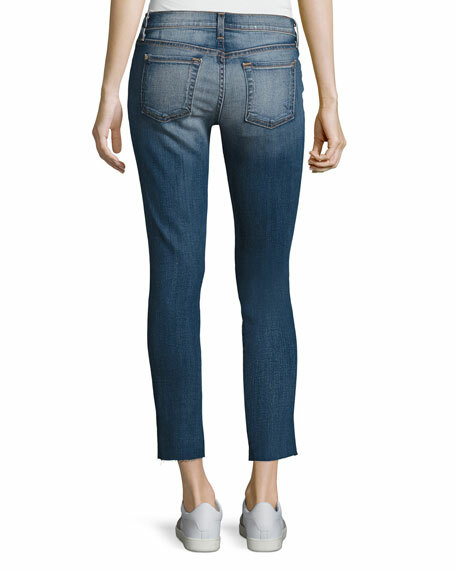 J Brand "Mama J" jeans in coated denim. Soft elastic panels for room to grow with each month. Mid-rise; belt loops. Back patch pockets. Fitted through skinny legs. Ankle length. Button/zip fly. Cotton/nylon/spandex. Made in USA of imported material. Joe's Jeans "The Icon" jeans in Deep Orchid (dark red) coated stretch-denim. Five-pocket style. Low rise. Fitted through skinny legs. 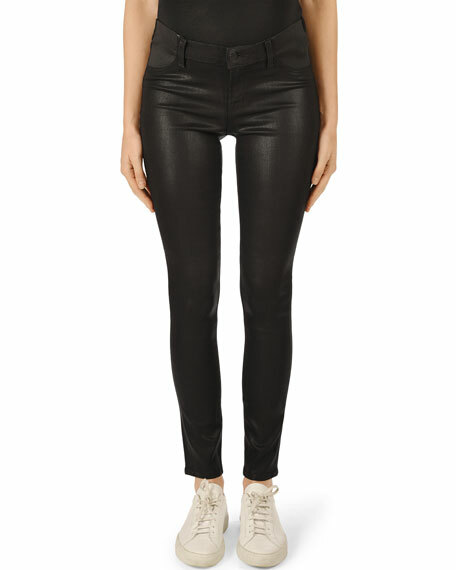 Cropped above the ankles. Button/zip fly; belt loops. Cotton/modal/spandex. Imported of Italian material. 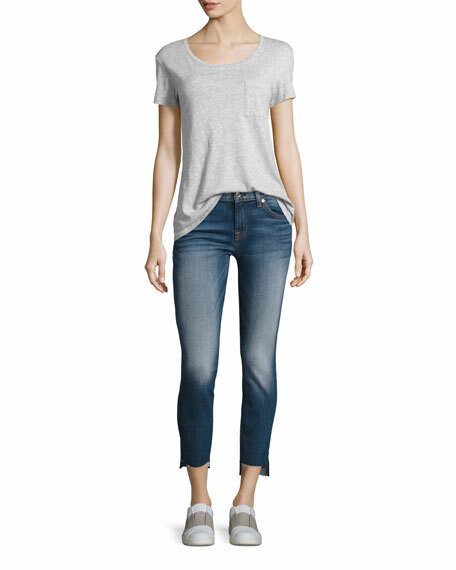 L'Agence "Margot" jeans in stretch-denim. Approx. measurements: 9.8" rise; 26" inseam; 9.5" leg opening. 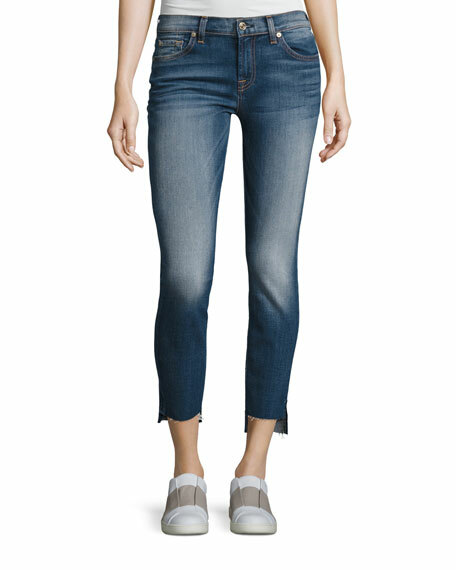 Contoured waistband for comfortable, no-slip, no-gap fit. High-rise; belt loops. Five-pocket style. Skinny legs. Ankle-length. Button/zip fly. ... Made in USA of imported materials.